"PHET" has strengthened further to Very Severe Cyclonic Storm during the last 6 hours. Current location is 18.2N 60.0E about 300 Kms South East of Oman Coast. Winds are at 125 Knots with Central pressure of about 929 Mb. The Wave height is 7 meters. Defying all predictions, of re-curving at 62E, it has moved North-Northwest continuously, and has progressed towards Oman. 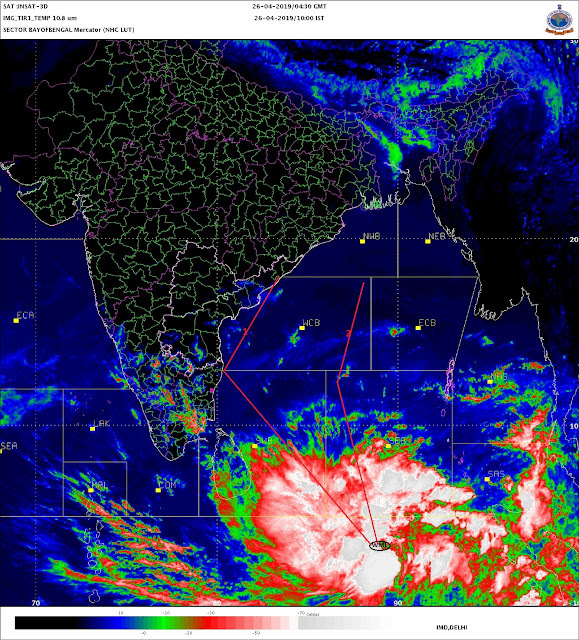 It is expected to strengthen further and track mainly North- Northwestwards direction for the next 24 to 36 hours. Now, it is expected to initially strike the North-Eastern coast of Oman in the next 24 hrs. It is important for all Arabian Sea coastline countries from Oman, Iran, Pakistan & India to be watchful and closely monitor "PHET" for any track changes. Even though "Phet" is more than 1100 Kms. from Saurashtra Coast, due to the Intensity of this system, we can expect windy conditions and scattered rains in pockets for Saurashtra due to the the moisture incursion from Arabian Sea..
"PHET" is only 300 Kms South-East of Oman Coast and due to the proximity precautions about very windy conditions as well as flash flooding due to rains need to be taken. Most Forecast models are expecting a Recurve North Eastwards after 36 hours.